Progress. 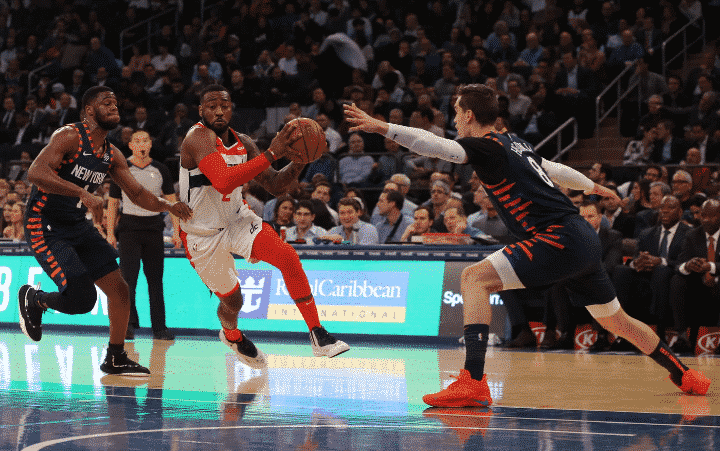 The Washington Wizards hung on late and defeated the New York Knicks 110-107 at Madison Square Garden. The first dagger of the season occured thanks to a late three from John Wall and the Wizards have won back-to-back games. A lot of things went right for Washington tonight. Otto Porter Jr. brought the defensive intensity like he should be. Bradley Beal made the extra pass. Tomas Satoransky continued to be the passing artist that he is. Markieff Morris got to his spots and of course, John Wall hit the dagger. All in all, that progress made from those players led to a rocky, griity 110-107 win over the hungry Knicks. Wall (18 points, 15 assists) and Beal (27 points, 7 assists) were crucial to the win despite their awful shooting. Kelly Oubre Jr. (21 points) and Morris (18 points, 7 rebounds) also played big roles. There are certain players on the Wizards who are instrumental in wins. While Wall and Beal are the root of team success and failure, it is guys like Otto Porter Jr. and Tomas Satoransky that control how good or bad this team does. When those two are playing well, it leads to team success. When those two are off, it leads to total disaster. The defense is a lot better which leads to easy transition buckets. Otto’s three steals and three blocks were huge in tonight’s win. Despite only having three points, three assists and two rebounds, Satoransky made a huge impact tonight. He had a +15 and made the extra pass that helped force a big run from the Wizards in the third quarter. When he and Porter can set the tone with their effort, everything gets a whole lot easier for Washington. Oubre has not had an assist over the last four games as he’s been more concerned with his shots but tonight was different. Oubre did a better job of balancing his shooting possessions with the occasional ball movement. That is easy to see when a player has 21 points on eight-of-11 shooting. However, he also added five rebounds and three blocks which led to Wizards fans witnessing Oubre’s best performance this season. While he did not have the best game, John Wall was still able to come up huge late in the game. Late in the fourth quarter, John Wall sank a three which was the dagger and stopped any comeback the Knicks could have possibly had. It is looking good for the Wizards right now but they have to keep this up to start a comeback.